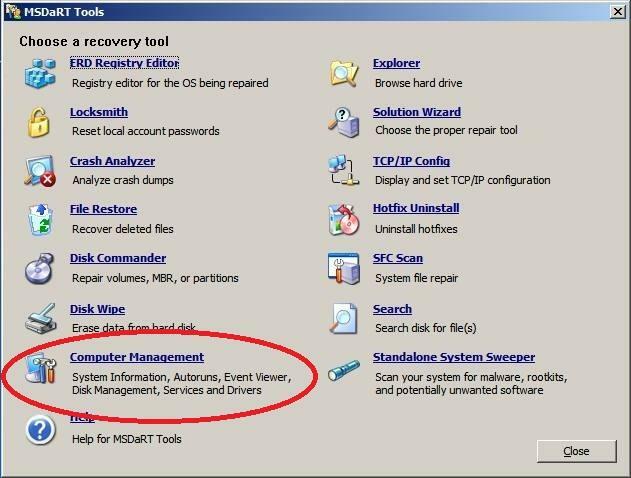 The latest versions of ERD Commander for Vista and Windows 7 are contained in The Microsoft Diagnostics and Recovery Toolset (MSDaRT ) which is part of the Microsoft Desktop Optimization Pack (MDOP). 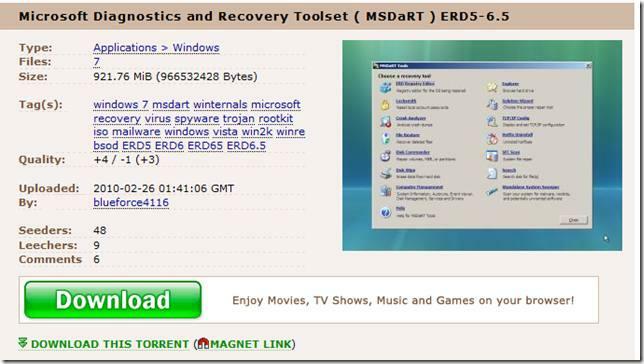 Microsoft Diagnostics and Recovery Toolset (MSDaRT ) 5.0 (for XP), 6.0 for Vista, and 6.5 and 7 for Windows 7 is a complete suite of powerful and versatile tools released by Microsoft (formerly Winternals) that allows you to repair unbootable or locked-out systems, restore lost data, and diagnose system and network issues while the system is safely offline. In order to obtain the latest versions of ERD Commander, you need access to Microsoft Desktop Optimization Pack (MDOP) which contains MSDaRT. ERD Commander is a very powerful tool. It comes in the form of an ISO file which is burned to a CD which is a diagnostic and recovery boot disk for Windows 7 and Vista. ERD50 2005/2007 for Win 2K, XP, Server 2003 – x86 Click for 30 Day Trial and FREE version! thepc.tech has download links to the MSDart 7 and 6.5. These appear to work well. Many other unofficial versions are can be found on torrent sites like the Pirate Bay. The ERD Registry Editor utility on the MSDaRT Tools menu provides information about the registry that can help you repair a system. The Crash Analyzer can be used to diagnose the cause of a system crash and identify the driver that caused the failure. The Disk Commander can be used to salvage or repair partitions, or volumes. The Disk Wipe utility can be used to erase disks or volumes. The Search utility allows you to restrict the scope of your search by specifying part of the name, search location, estimated size of the file, or the time when the file was modified. The Explorer utility allows you to browse folders and files that are stored on various drives. Disable problematic drivers or services. Partition and format hard disk drives. Get information about the computer. The Hotfix Uninstall can be used to remove Windows hotfixes or service packs from a system that cannot be started. The SFC Scan utility helps you check system files and repair any that are corrupt or missing. With 32Bit systems you should be able to attach to the installation, and use Locksmith (to reset Windows passwords) and use Windows Explorer to move files onto a USB memory key or external hard drive (see here). 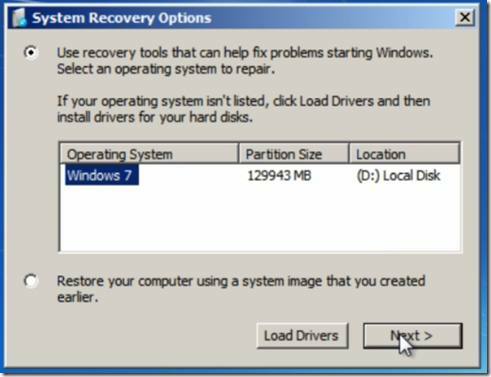 However attaching to Vista or Windows 7 installations wipes out any System Restore points, so this should be done with caution. 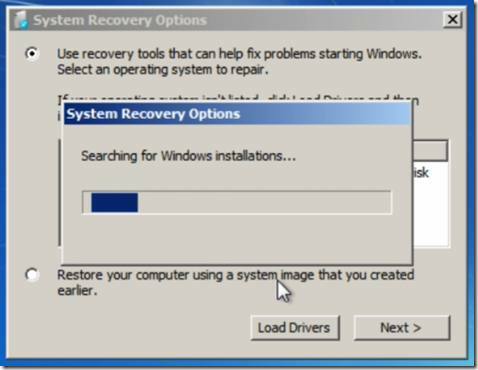 With 64bit Windows 7 and Vista systems it will not be possible to attach to the installation, but it should still be possible to boot your PC or laptop by not attaching to the installation. You can then use Windows Explorer for Data Recovery – to move files onto a USB memory key or external hard drive, (see here) but none of the other ERD Commander tools will work. Get 2007 ERD Commander for Windows XP for FREE! i have download erd 6.0 from torrents is it work for vista live business for changing user or admin password. Alan, does this work with Win 7 operating system?